* Block reward and block time results may vary over time. R3-LTC is also a 2.4G wireless router that supports PPPoE, WEP/WPA/WPA2 encryption and a WiFi transmission rate of up to 300Mbps. The user interface of the R3-LTC uses a web version of the open-source and powerful OpenWrt firmware to deliver a smooth user experience with various customization options. 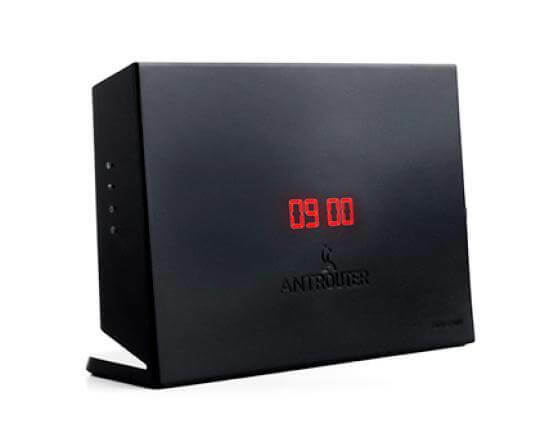 The R3-LTC has a glossy front panel that not only looks great on a desk but also has a built-in bright LED clock that displays the time, even in the dark. The ergonomic design makes the table-top clock easy to watch in a work environment. The R3-LTC has been optimized and designed for Litecoin mining but may be used to mine any Scrypt algorithm based coin. Furthermore, you can mine on any mining pool you choose, a significant enhancement over the earlier AntRouter R1.